Congratulations to Bert S., the Michigan 3-Day’s Milestone Award Winner! 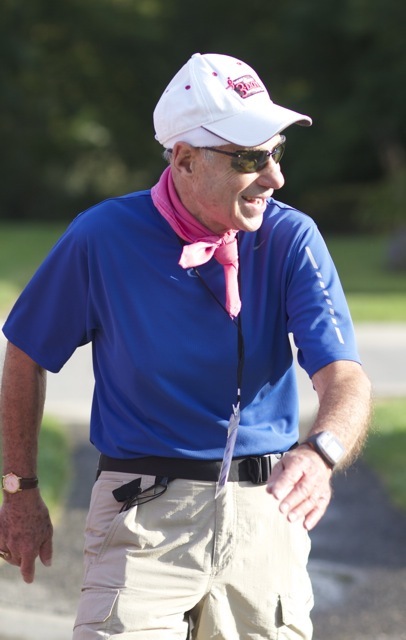 As a veteran 3-Day walker, Bert said that his best advice to anyone walking the 3-Day is to train, train, train. “I cannot put enough emphasis on training — start with short distances and work your way up. Stay focused on “finishing” the event,” he said. Bert also adds that in his personal experience, after about fourteen miles, completing the walk is “all mental”. Like many 3-Day walkers, Bert is aware of the risk of breast cancer and how it can change a family. Bert has been married for 60 years, to his wife Marion, and he has four daughters, three granddaughters, and a grandson. “I have a lot of good friends who have been touched one way or another by this disease. It’s their mother, their grandmother, their wife…This disease can hit anyone at any time and I literally walk today so that someday, there will be no reason to walk. I have met some amazing people over the years and they continue to inspire me with every step of every walk.” You inspire us too, Bert.